The story and lure of Jeff George never stops being funny or gets old to me. I love to hear updates on Sportscenter in Week 8 when a team has lost their top two quarterbacks and Jeff George says that his arm is locked, loaded, and feeling better than ever. Sure, Jeff George hasn’t played in the NFL since 2001 but who’s to say that he couldn’t be better than Caleb Hanie? I decided that I’d check Twitter to see if there were any people out there talking about Jeff George. Luckily for me I’m not the only one who can’t get Jeff George out of my mind. Dropping a Jeff George and Ed Lover reference in the same tweet. Very impressive. Next time I’d like to see you throw in Simon Rex and Danny Kanell. I don’t know why this guy is talking in all caps or why he is trying to argue that Tom Brady didn’t make Randy Moss. That’s not the point. The point is that this guy mentioned Jeff George and more importantly, his Twitter handle is “Hugh Jerection”. You can’t make stuff like this up. Let me get this straight, some random guy named Jesse Leman is rooting for both a Jose Canseco AND Jeff George comeback and is tweeting all this to Jose Canseco to show his support. Wow! There’s got to be a 75% chance that this guy also owns a Jamie Moyer jersey. There is a 100% chance that the next toast I do will be to Jeff George thanks to this tweet. What a great idea. Thanks Maria. That my friends is dedication. 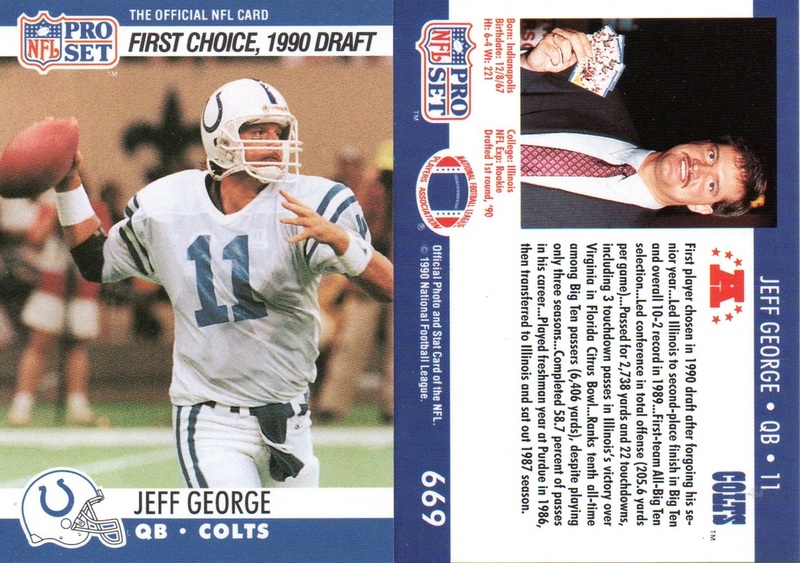 Here’s what the regular 1990 Pro Set Jeff George card looked like.